Taylor Insurance Services provides the full spectrum of solutions. 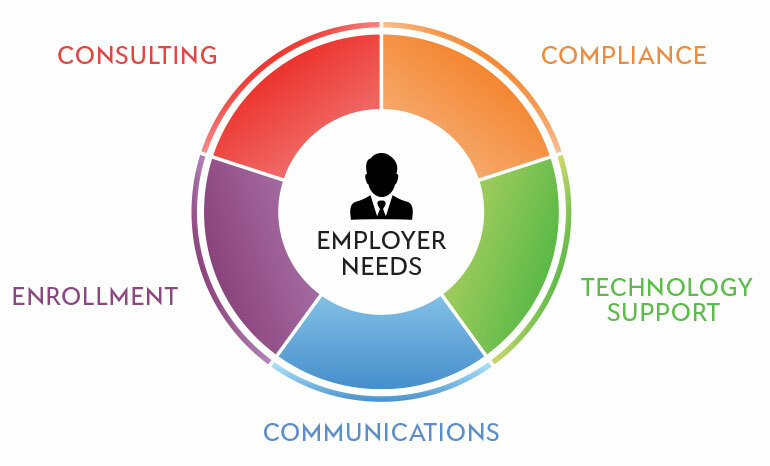 Taylor Insurance Services provides the full spectrum of solutions for employers and their employees. We understand the challenges in today’s employee benefits landscape and believe in personalized service. From benefit administration to compliance reporting to communications, we provide a wide range of solutions to fit the needs of your business. Benefit Plan and Carrier Analysis: We’ll help you choose which plan and carrier are right for your needs. We will work with you to create a comprehensive plan that also keeps costs at a minimum. Health Insurance: We can offer options whether you want to go the traditional route with a fully insured health plan through an insurance carrier or you want to operate your own self-funded health insurance plan. We can also include options for Health Savings Accounts (HSA), Health Reimbursement Accounts (HRA), or Flexible Spending Accounts (FSA) to help your employees manage their medical expenses more easily. Voluntary Benefits: We’ll help you decide on adding additional benefits to make for a more robust employee benefits plan. You can choose from options such as dental, vision, disability, life insurance, cancer, critical illness, accident, and hospital indemnity. Ancillary Benefits: Learn about providing additional coverage for your employees that goes beyond the typical health care plans such as remote diagnosis and treatment also known as telemedicine. We will also show you how you can help to further protect your employee’s finances with options like Prepaid Legal. Retirement Planning: We’ll explain how you can offer options to help your employees start planning for their retirement. We’ll also partner with you to ensure your plan is in compliance and well-managed. RFP Development and Management: Our team will consult with you on developing and managing requests for proposals (RFP) to various insurance carriers. This will ensure you receive the most affordable and comprehensive plan possible for your employee benefits plan. Health Plan Management: Your employee benefits plan has a lot of moving parts that may create questions for you or your employees along the way. We can provide guidance when it comes to Disease and Case Management, Wellness Design and Implementation, Billing Management Assistance, Claims Analysis and Advocacy, Benefit Plan Benchmarking, Dependent Audit, and Budget Analysis. We want you to be able to easily manage your plan, claims, and billing in order to reduce risk and keep costs down wherever possible. COBRA: Give your employees the right to maintain coverage after they’ve lost their job or left the business. We’ll help you manage all the details and maintain compliance with continued health insurance. HIPAA: Ensure that your practices and procedures are in line with protecting employee data and safeguarding their information. We’ll help you review your current practices and provide suggestions on where improvements can be made. DOL: Stay on top of the Department of Labor’s constant law changes. Avoid having to pay hefty fines or endure extensive, time-consuming audits. FMLA: This law allows for up to 12 weeks of unpaid, job-protected leave for certain employees. If your business qualifies for the Family and Medical Leave Act, we’ll help you understand how employees become eligible for protection from losing their insurance. Section 125: We’ll guide you through all of the IRS rules and regulations to help you deduct employee insurance premiums pre-tax. This will also help your employees to benefit from pre-tax savings. ACA: The Affordable Care Act completely changed the landscape of health insurance, and more changes are likely to come. Our team is fully versed in all of the requirements your business needs to follow to maintain compliance. 6055 and 6056 Reporting: New health insurance requirements can be overwhelming and confusing for most businesses. We’ll help you with the required reporting by the IRS for the Affordable Care Act. 1094 and 1095 Filing: If you are required to provide health insurance to your employees, you will need to file these reports. We can remove any guesswork so you can prepare these forms accurately. HR Document Auditing and Building: The entire HR process is immersed with multiple forms that need to be filled out by you and your employees. We can help you ensure that you are utilizing all of the required forms and create any forms necessary to streamline the process. Summary Plan Description (SPD) Auditing: Your SPD must inform plan participants and their beneficiaries of their rights and obligations. Our highly knowledgeable team can perform an audit so that the information in your plan is communicated in a way that is understandable to its participants. Health Care Reform Information: Health care has changed dramatically and is expected to undergo additional changes. We can assist you with understanding and implementing the latest changes. Employee Handbooks: Your handbook details all aspects of working with your company. We’ll help you create and handbook or audit an existing one so that your business is protected from any potential issues that can arise due to missing or incorrect information. Benefits Administration Software: Remove mundane or time-consuming tasks with the latest software technology. You’ll also benefit from more accurate recording and reporting. Benefit Plan Transparency: Our business wouldn’t be successful without the trust of our clients. We will provide you with every detail on the benefit plans we recommend so you can make the best possible decision. Plan Decision Support: Many plans exist on the market, which can make decision-making a daunting task. We offer support to help you choose a plan that’s right for your business and your employees. Medical & RX Analytics: We can help you decipher all of the different types of coverage, co-pays, and deductibles available in the plans we recommend. We’ll perform an in-depth analysis to determine your best option. Plan Disruption Analysis: With all of the choices available, you may want to consider switching to a different benefits plan. We can help you determine if this type of move is a good choice for you and your employees. Carrier Portal Management: The more connected you are with your provider, the easier it will be to get answers or solutions when problems arise. We’ll get you registered and offer assistance on understanding your carrier’s portal so you can get responses to your questions quickly and accurately. Health and Wellness Content: Knowledge is power and nowhere is this more true than when it comes to your employee’s health. We’ll give you access to the best resources to provide you with information on the latest health news and trends. Employee Newsletters and Videos: Education about healthcare can keep your employees engaged and informed. We’ll help you structure a plan that delivers timely information through newsletters and video content. Benefits Education Campaigns: Want to focus on staying fit, eating less processed foods, or losing weight? We’ll assist you with developing a campaign that is geared towards helping employees tackle their most challenging health issues. Health Pro Services: Healthcare can create multiple levels of confusion and anxiety for your employees and their families. We can connect you with resources to provide your staff with the expertise of professionals for simpler solutions. Employee Questionnaires: Including your employees in decisions about the plans you offer can provide you invaluable insight. We can help you create questionnaires designed to engage employees and increase retention. Social Media Consulting and Content: Give your employees the option to take their healthcare online. Chances are they are already on social media so this offers them an added convenience to better manage their health. Open Enrollment Management: Open enrollment can be a very stressful time for HR personnel. We can offer solutions that will help make this process as smooth as possible. New Hire On-boarding: New hires are required to fill out a lot of paperwork and something missed could lead to a potential liability. We can help you organize this process to enhance efficiency while reducing risk. Electronic Enrollment Data to Carriers: Enrolling employees into a benefits plan involves a significant amount of data. Submitting this information electronically can be a safer and quicker alternative. Life Event Administration: The more employees you have, the more likely someone will experience a life event that will impact their coverage. We can offer support to determine the impact and how your employee is affected. Employee Decision Support: An employee relies on their health coverage to keep them healthy and protected. Our team can offer solutions to help your employees make the best possible decision about the coverage they need. Enrollment Materials Development: Enrolling employees often brings about many questions that require answers. We can help you develop enrollment materials that provide information and will keep questions and concerns to a minimum. You have challenges, we have solutions. What’s your biggest complaint with your employee benefits?